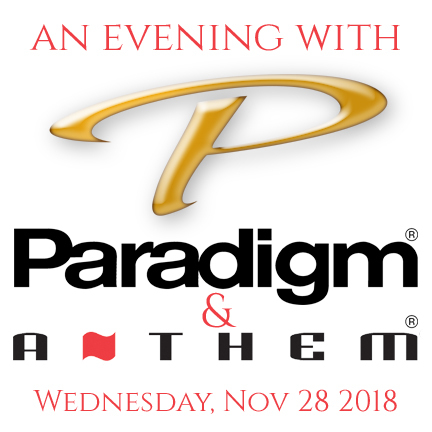 Please join us on the evening of Wednesday, November 28th for this special event. 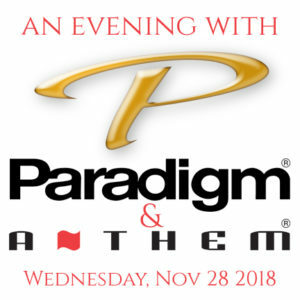 John Bagby, Anthem’s Product Manager, together with representatives from the Paradigm/Anthem sales team, will be on hand to discuss all the class-leading technologies developed by Anthem and Paradigm. Products to be showcased will include the award winning Anthem STR series of electronics and Paradigm Persona loudspeaker range. Please RSVP to events@audioark.com. Doors @ 6:30PM. Space is limited.